Capcom has successfully reinvented Resident Evil in the past, the most notable deviation being the brilliant Resident Evil 4. This new vision doesn’t reach the same heights of spectacle and gameplay innovation as that breakthrough release, but is a welcome addition to the series (both in terms of gameplay and lore), and a nice entry point for newcomers. This went from "not even being remotely on my radar" to "actually considering a purchase" in no time flat; I wasn't expecting such a solid reception. I'm glad they've abandoned the grand ridiculousness of the latter part of the series, instead opting to hew closer to the first three games in terms of action and tone. I much preferred the more isolated areas from the first three games as opposed to the grand bioterrorism plots of 5 and 6. Last edited by Chimpbot; 01-23-2017 at 11:11 AM.. Very exciting, going to play it on PSVR. Texas Chainsaw Evil 7 will never top Resident Evil 4. But at least this is a step on the right direction after 6. No Mercenaries mode, so now this drops down to rental at best. I don't understand the love for that game. As soon as I was running away from a deranged midget dressed as napolean and driving a giant mechanized version of himself, I was like " this is just garbage..."
In a series know for its camp and over-the-top sequences, that is the hardly the worst sin the series has committed. I'm one of those people who thought "Resident Evil 4" was the best RE game. Besides impressive visuals, solid controls and a near-perfect auto-difficulty level, it had exactly the right mix of suspense, fear and empowerment for me. I believe not that many people enjoy running away/hiding/cowering in fear all the time. This might work for a USD 19.99 title like "Amnesia: The Dark Descent", but even that one only ever sold at discounted price points. As soon as you go full-price, your game is bound to fail (see the critically acclaimed "Alien: Isolation"). On the other hand, the polished visuals of RE5 couldn't mask the fact that the action felt clunky, and the story was even more of a mess than RE4's. I did enjoy upgrading my characters and playing co-op, but the Biohazard/RE formula was barely reconizable at this point. 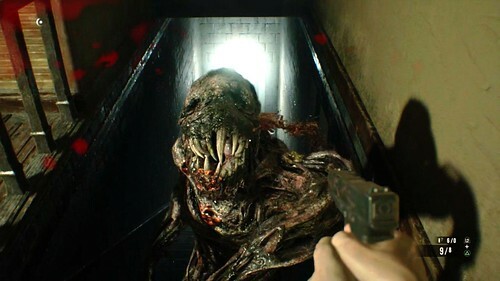 Enter "Resident Evil 6". What a mess. I only ever finished one of the campaigns because my RE5 co-op partner insisted we give it a try. So, yeah, I'd say Resident Evil 4 was the best of the bunch. Part 1 and 2 got by on amazing graphics (for the time) and a surprising amount of violence (again, for the time). After the formula got stale in RE3 and the Dreamcast flopped (Code Veronica was too hard for mainstream gamers, anyway), RE4 stood out like a shining beacon during the PS2/Xbox/GC console war! This times a thousand! Yes the story in Resi 1-3 was dumb as all hell but not in a "midget driving a concrete mech" kind of way. While the gamplay itself was groundbreaking the atmosphere was all but gone. Resi 1-3 made you care about the locations you were in and those places were part of the story. In Resi 4 everything felt more like an obstacle course. As for Resi 7 I will pick it up ASAP! You're right about the gameplay in RE4 being fun. I played it on the Wii and I thought ht gameplay was incredibly fun. It was just everything else that was mind numbingly stupid. Like the way Leon keeps finding eloquently worded notes that explain, in depth, exactly what the badges plans are? There was one part specifically where a not is like, "Make sure the monster is ready on the path up ahead and to the left. And make sure the treasure is well stocked on the path up ahead and to the right." I can't remember the exact wording but I bust out laughing when I was playing it. It just baffles me how there are people who take the story of the game extremely seriously. For me, RE 2 was the best the series ever got. I remember enjoying that game. I agree -- game looks good. I kind of like the creepy CG look of the characters, there's a tinge of uncanny valley left that actually helps the aesthetic, heh. I was thinking while watching it on Twitch about how RE4's outdoor environments (all the trees they rendered in the distance) really blew me away at the time, and how much better this game looks than that one (the last one that REALLY impressed me). All of the foliage in the new one specifically impressed me out of the gate -- I found my brain thinking "Man, if these plants had a bit of sway to them ala SpeedTree, this would be mind blowing! ", but then I told my graphics-whore mouth to STFU!